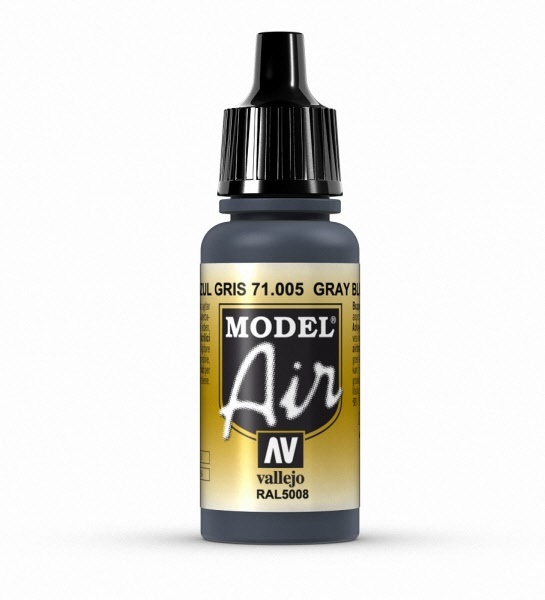 Introduction: Model Air is a range of water-based, matte acrylic colours, developed especially for airbrushing. In the formulation of this range various new resins have been selected for qualities which up till now had not been achieved in water-based colours. The strength, resistance and covering power of Model Air is superior to any acrylic airbrush colour currently available and also allows for application by brush to highlight the smallest details of the miniature. The pigments have been selected according to their degree of light-fastness and optimum micronization. The effects of washes and transparencies can be obtained by diluting the colours; all colours and varnishes can be mixed together and diluted with Airbrush Thinner. 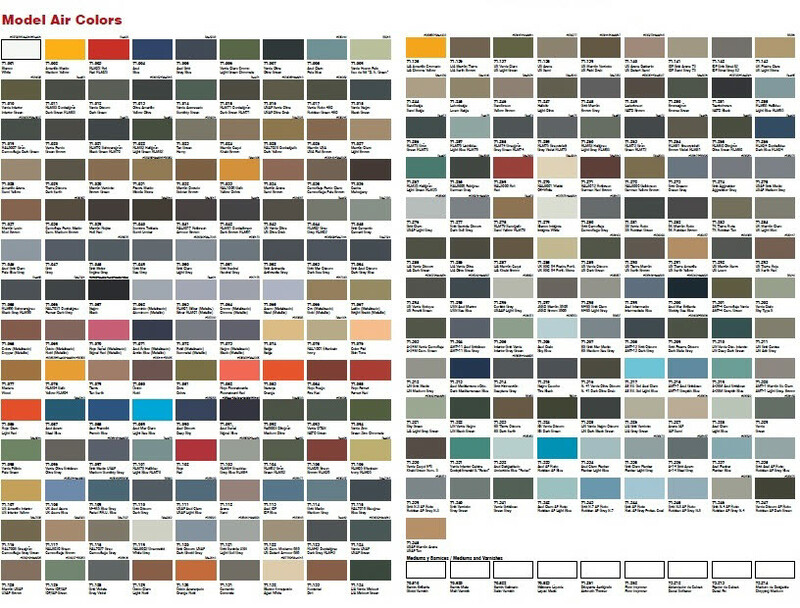 Colour Range: The colours have been very carefully chosen to provide the model painter with the references most frequently employed. Tests have been carried out for over two years to develop the tonalities which correspond to the RLM, RAL and FS, BS and ANA colours commonly used. Colours can be mixed with one another, diluted with water, Model Air Thinner or Varnish or even alcohol, according to the effect desired, but we recommend the use of Model Air Thinner since this product conserves the properties of the colours. Surfaces: Model Air adheres exceptionally well to all surfaces. The adhesion of Model Air to resin models, plastics, steel and white metal is extraordinary. A primer is usually not needed; if the object to be painted is very dark, a base coat of white or grey will help bring out the luminosity of the colours. How to use: Shake well before using. Pour the paint directly into the airbrush, either undiluted or previously diluted with Thinner (71.261). Colours can be mixed in the cup of the airbrush. Model Air dries almost instantly on the model and permits immediate application of ageing processes as well as the use of washes, pigments, and dry-brush techniques. Varnishes: The varnishes have been formulated especially for airbrushing. Drying is very fast and does not leave fingerprints (no tack). Varnishes can be applied directly or diluted with distilled water or Thinner 71.261. In some cases, a layer of varnish is enough but if more layers are required, an interval of 5 minutes is suggested between each coat. Once protected by the varnish, the colours resist the application of oils, glazes, and even pure turpentine and light washes with alcohol. Airbrush Thinner 71.261: The Airbrush Thinner can give more flexibility to the colour without causing a loss of adhesion, opacity and covering properties The product also helps to delay the drying of paint inside the airbrush mechanism, so that is advisable to add a few drops of Thinner while working. For dilution with Thinner, the recommended proportion is 1 part Thinner to 3 parts paint. Distilled water changes the properties of Model Air but is not incompatible. Airbrush Flow Improver: A medium designed to improve the flow and delay the drying of paint on the needle while airbrushing. It is recommended to ad 2 drops of Flow Improver to 10 drops of paint in the cup of the airbrush. Airbrush Cleaner 71.099: Airbrush Cleaner is the solution for cleaning the airbrush between one colour and another. The product quickly removes the remains of the old paint and also lubricates the airbrush without damaging its mechanism. While painting, the tip of the airbrush should be cleaned occasionally with a cloth moistened with cleaner to remove traces of dried colour; this will prevent splattering or the clogging of the airbrush. Airbrush cleaner can also be used on the model as a stripper to remove paint or to correct errors in the application of the colours. Surfaces Primers: The water-based acrylic-polyurethane primers dry quickly to the touch, and confer a mat, self levelling base coat of extraordinary resistance; the painting of the model can be continued almost immediately. Chipping Medium: A product which can be used by brush or airbrush to create effects of wear, rubbing and chipping on acrylics. Safety/toxicity: Model Air has the following international safety certificates: EN71-3:2013 and ASTM D-4236. These independent certifications guarantee that no harmful substances are used which could pose a risk to the health of both the user and the environment. Airbrush and Compressor: The viscosity of Model Air lets you work with airbrushes as small as 0.2 mm without diluting the colours. Environmental conditions can alter the viscosity of the product and cause the need for further dilution. We recommend working with a compressor pressure between PSI 10-15, 0.75-1.10 Bar, (0.5-1 kgs). brush to highlight the smallest details of the miniature. The pigments have been selected according to their degree of light-fastness and Optimum micronization. The effects of washes and transparencies can be obtained by diluting the colours; all colours and varnishes can be mixed together and diluted with Airbrush Thinner. Model Air Thinner or Varnish or even alcohol, according to the effect desired, but we recommend the use of Model Air Thinner since this product conserves the properties of the colours. Model Air adheres exceptionally well to all surfaces. The adhesion of Model Air to resin models, plastics, steel and white metal is extraordinary. A primer is usually not needed; if the object to be painted is very dark, a base coat of white or grey will help bring out the luminosity of the colours. Bottles of 17 ml with eyedropper. This packaging prevents the paint from evaporating and drying in the container.